It will soon be illegal to use electronic cigarettes, the popular vapor substitute to traditional tobacco cigarettes, in public indoor spaces in New York State. Democratic Gov. Andrew Cuomo on Monday signed a bill to ban vapor substitutes, or e-cigs, anywhere tobacco cigarettes are already prohibited, including workplaces, restaurants, and bars, the New York Times reported. The State Assembly added the ban on vaping, which will go into effect in 30 days, to New York's Clean Indoor Air Act this summer, and the Senate approved the measure. New York created the act in 2003, making it one of the country's first states to ban smoking tobacco products in public indoor areas. The now-$2.5 billion e-cig industry continues to grow in popularity, according to the Centers for Disease Control and Prevention, which says that while the negative health consequences of the product are not widely understood, there are reasons for concern, including nicotine addiction. "These products are marketed as a healthier alternative to cigarettes, but the reality is they also carry long-term risks to the health of users and those around them," Cuomo said in a statement. "This measure closes another dangerous loophole in the law, creating a stronger, healthier New York for all." A 2016 study by the New York State Department of Health found that 20 percent of children had tried e-cigs, double the number from two years prior. 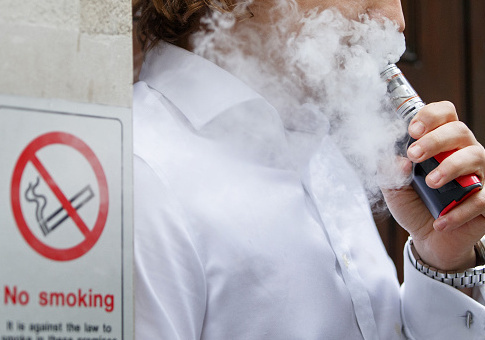 The state in July banned e-cigs from all school grounds. New York City banned e-cigs back in 2013, including the measure in the city's Smoke Free Air Act. Manufacturers have fought back against the city, however, mounting several legal challenges that argue e-cigs do not qualify because they do not emit smoke. The New York State Court of Appeals rejected the most recent challenge to New York City's ban earlier this year, finding the inclusion of e-cigs in the law was valid. Jeff Seyler, executive vice president of the American Lung Association's Northeast region, said the new state law will protect the public's health and help shield children from the "dangerous and often lifetime addiction to nicotine." But proponents of vaping argue that e-cigs are a safer alternative to cigarettes. "Our customers they know that they can't be walking through a store vaping, or sitting at a bar vaping," said Aman Singh, owner of Long Island Vape in Huntington Station, N.Y. "They don't feel like doing it anyway because it's obnoxious." Singh, who indicated that he believes the new law is unnecessary, said the products he sells may be a health risk but are the lesser of two evils. He added that most of his customers use it as a way to quit tobacco cigarettes. "We're out here trying to help people," Singh said, noting his worries about the impact the ban may have on his customers. "I think people will start smoking cigarettes again." This entry was posted in Issues and tagged Andrew Cuomo, New York, Tobacco. Bookmark the permalink.